Question: Why does the bishop wear bells on his vestments? "“You shall make the robe of the ephod all of blue. There shall be an opening for his head in the middle of it; it shall have a woven binding all around its opening, like the opening in a coat of mail, so that it does not tear. And upon its hem you shall make pomegranates of blue, purple, and scarlet, all around its hem, and bells of gold between them all around: a golden bell and a pomegranate, a golden bell and a pomegranate, upon the hem of the robe all around. And it shall be upon Aaron when he ministers, and its sound will be heard when he goes into the holy place before the Lord and when he comes out, that he may not die." (Exodus 28:31-35). Since the High Priest entered into the Holy of Holies alone, the bells allowed those on the outside to at least hear the sound of the sacred actions that they could not see. The statement "that he may not die" may suggest that the ceasing of the bells would alert those outside of the holy of holies that the high priest had died. However, the way this is worded, it would more likely suggest that in some way the bells would prevent the High Priest from dying. 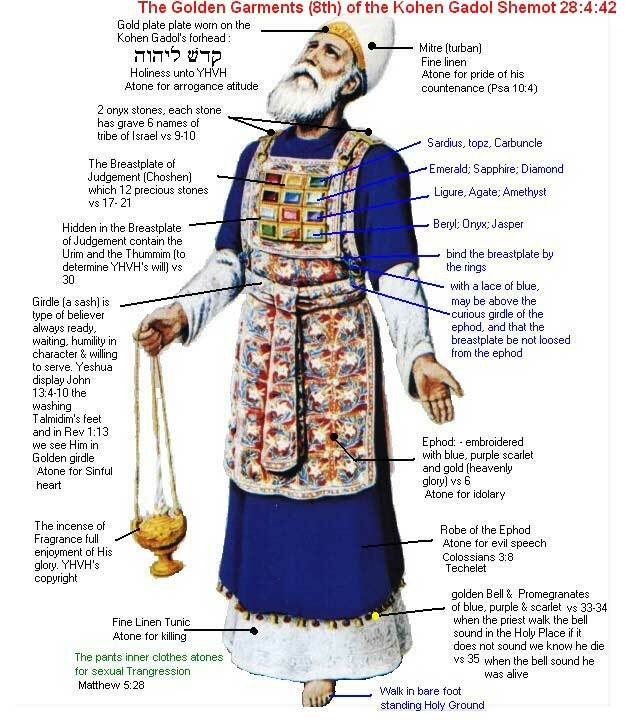 "He clothed him in perfect splendor, and strengthened him with the symbols of authority, the linen undergarments, the long robe, and the ephod. And he encircled him with pomegranates, with many golden bells all around, to send forth a sound as he walked, to make their ringing heard in the temple as a reminder to his people" (Ecclesiasticus 45:8-9). So in what way could the bells save the High Priest from death, and also serve as a reminder to the people? "He also clad the priests in the most comely attire to impress the people with their extraordinary appearance and to teach the priests how to beautify the soul and bedeck it with the adornment of virtue. By "undergarment" he referred to the inner, and by "outer garment" to the outer tunic. He commanded the latter be blue in color and called it "full length," because it reached to the top of the feet. To this he attached golden bells and pomegranates so that, on entering the unapproachable precincts and hearing the sound issuing from these, Aaron might celebrate the rite with reverence and call to mind him who had commanded these things and who was to receive the worship being offered" (Theodoret of Cyrus,trans. Robert C. Hill, The Questions on the Octateuch, vol. 1, On Genesis and Exodus, (Washington, D.C.: Catholic University of America Press, 2007), p. 323). The bells were a constant reminder to the High Priest of the sacredness of his ministry, and by keeping this in mind, he would not act in an impious manner, which might lead to his death, as happened in case of Nadab and Abihu, the sons of Aaron, who brought "strange fire" before the Lord, and were struck dead as a result (Leviticus 10:1-7). Likewise, the bells were a reminder to the people of the holiness of God's Temple, and the piety of the worship that God required of His ministers. And so the purpose of the bells on the vestments (specifically, his Mantia and Sakkos) of the bishop are likewise to be a constant reminder to both the bishop and the people that "Holiness becometh Thy house, O Lord, unto length of days" (Psalm 92:5). 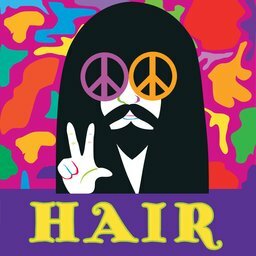 Question: How do you reconcile the Orthodox practice of clergy and monastics not cutting their hair with 1st Corinthians 11:14, which says: "Does not even nature itself teach you that if a man has long hair, it is a dishonor to him"? The way this verse is translated by the Revised Standard Version as "Does not nature itself teach you that for a man to wear long hair is degrading to him". The question then is whether this verse is saying it is a dishonor to a man to have long hair, or is this verse saying something about the way a man wears his hair. It is highly unlikely that St. Paul was objecting to men simply having hair beyond a certain length. In the Ancient world, men having long hair was not regarded as abnormal, but rather was the norm. Most men did cut their hair infrequently. For example, we are told in Scripture of Absalom (the Son of King David who eventual led a revolt against his father): "at the end of every year he cut [his hair] because it was heavy on him—when he cut it, he weighed the hair of his head at two hundred shekels according to the king’s standard" (2 Samuel 14:26). And Absalom's appearance was far from something that was considered to be odd or inappropriate, but on the contrary, we are told: "Now in all Israel there was no one who was praised as much as Absalom for his good looks. From the sole of his foot to the crown of his head there was no blemish in him" (2 Samuel 14:25). Also, in the Old Testament, there were Nazirites, who would take a vow either for a period of time, or in some cases for life, and one of the things that being a Nazirite entailed was that they could not cut their hair while under the vow, unless they came into contact with a dead body (Numbers 6:1-21). 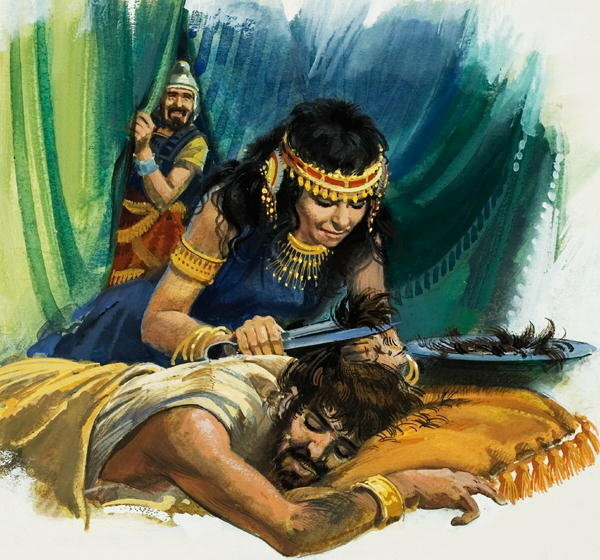 Sampson was a Nazirite from birth, and so only had his hair cut once... when Delilah finally got him to explain the source of his strength (which was his Nazirite vow, symbolized by his uncut hair), and then cut off his hair, his strength was gone, and he was taken captive by the Philistines. St. John the Baptist was a Nazirite from his birth, as was made clear by the words of the Archangel Gabriel to the St. Zachariah, "For he will be great in the sight of the Lord, and shall drink neither wine nor strong drink" (Luke 1:15, abstaining from wine being another aspect of the Nazirite vow, cf. Numbers 6:2-3). It is also fairly clear that St. Paul himself was a Nazirite. In Acts 18:18 we read: "So Paul still remained a good while. Then he took leave of the brethren and sailed for Syria, and Priscilla and Aquila were with him. He had his hair cut off at Cenchrea, for he had taken a vow. And in Acts 21, beginning at verse 15, we read about how St. Paul participated with four other men who had "taken a vow", and made the offerings in the Temple that those who had completed a Nazirite vow would make. St. James, the Brother of the Lord, who was also the first bishop of Jerusalem was also a lifelong Nazirite, according to St. Epiphanius (Panarion 29.4), which fits the description he is given in Eusebius's History of the Church: "He was holy from his mother’s womb; and he drank no wine nor strong drink, nor did he eat flesh. No razor came upon his head; he did not anoint himself with oil, and he did not use the bath" (Ecclesiastical History 2:23:5). Not only did Nazirites not cut their hair, but neither did the priests and Levites of the Old Testament "And they shall not shave their heads, nor shall they pluck off their hair" (Ezekiel 44:20 LXX). The Old Testament practices have not continued in the Church according to the strict letter of the Law of Moses, because for one thing, since the destruction of Jerusalem in 70 A.D., there has been no temple, and thus the sacrificial system of the Old Testament has entirely ceased to be. However, elements of it have survived. And with respect to cutting hair, with the exception of tonsuring, neither monastics nor clergy traditionally cut their hair. Also, according to the universal iconographic tradition of the Church, Christ Himself, and most other saints are depicted with long hair. And so, in light of all the evidence for long hair being a part of the Biblical and Ecclesiastical Tradition of the Church, it seems most likely that what St. Paul is referring to in this passage is to wearing one's hair in a particular way -- most likely styled in a manner customary for a woman. 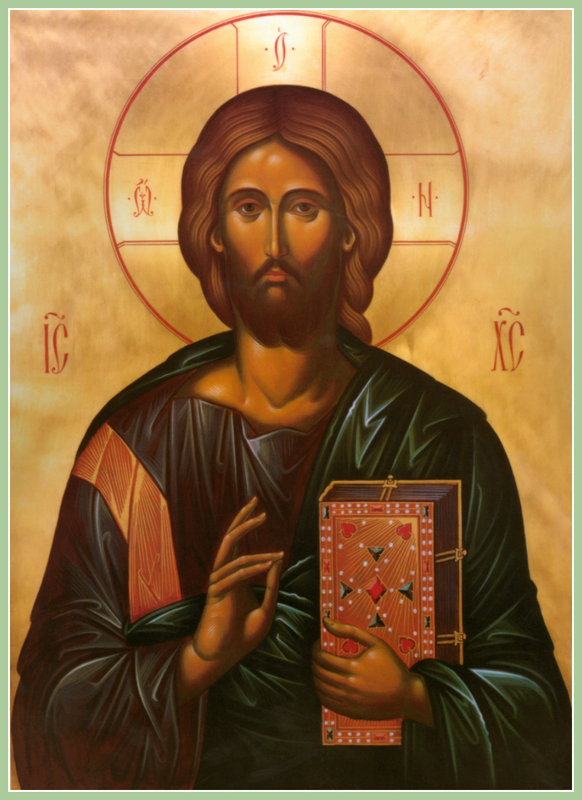 Concerning the Tradition of Long Hair and Beards, by Archimandrite Luke (Murianka). Should a pastor have long hair? (an article by a Presbyterian that is of interest). Question: "In Acts 15, while not imposing circumcision or kosher dietary laws on gentile converts, the Apostles nevertheless commanded then to abstain from the blood of animals (Acts 15:29). I have heard Orthodox Christians say that this was something that we no longer had to observe. Is that true?" Since we have heard that some who went out from us have troubled you with words, unsettling your souls, saying, “You must be circumcised and keep the law” —to whom we gave no such commandment— it seemed good to us, being assembled with one accord, to send chosen men to you with our beloved Barnabas and Paul, men who have risked their lives for the name of our Lord Jesus Christ. We have therefore sent Judas and Silas, who will also report the same things by word of mouth. For it seemed good to the Holy Spirit, and to us, to lay upon you no greater burden than these necessary things: that you abstain from things offered to idols, from blood, from things strangled, and from sexual immorality. If you keep yourselves from these, you will do well. Not only is there nothing in Scripture that would suggest that "these necessary things" have been set aside, but in fact there are several Ecumenical Canons that reaffirm them. "If any Bishop, or Presbyter, or Deacon, or anyone else on the sacerdotal list at all, eat meat in the blood of its soul, or that has been killed by a wild beast, or that has died a natural death, let him be deposed. For the Law has forbidden this. But if any layman do the same, let him be excommunicated." "Because of the fact that even God in giving the law about what may be eaten to Noah said to him: “Every moving thing that liveth shall be food for you; even like the green herb have I given you all things. But meat in the blood of its soul shall ye not eat” (Gen. 9:3-4), in the present Canon the divine Apostles ordain that any bishop, or presbyter, or deacon, or anyone else on the list of priests and clergymen, shall be deposed from office if be eat meat with blood, which is the animal’s life, meaning strangled, according to Chrysostom; or if he should eat meat killed by a wild beast—that is to say, an animal caught and killed by a wolf, say, or by a bear, or by any other such beast, or by a vulture; or if he should eat meat that has died a natural death—that is to say, a carcass that has died of itself: any clergyman, in other words, that is guilty of eating such flesh shall be deposed from office, since the Law too prohibits the eating of it,2 including both the law given to Noah, as we have said, and that given to Moses in ch. 17 of Leviticus. If, however, the one who ate it should be a layman, he shall be excommunicated. Moreover, in the new Law of the Gospel too such things are not allowed to be eaten. For these same Apostles held a meeting and wrote to the heathen inhabitants of Antioch and of Syria and of Cilicia the following words: “It has seemed right to the Holy Spirit and to us not to impose any further burden upon you, except what is necessary in these matters, to wit: to abstain from eating food offered to idols, and blood, and fornication” (Acts 15:28-29). The reason why animals killed by wild beasts or preyed upon by vultures, and those which have died a natural death or which have been strangled, are forbidden is that not all their blood has been removed, but, on the contrary, most of it remains in them, being scattered through out the veinlets of all the meat,1 from which veinlets there is no way for it to escape. Wherefore those who eat them are eating meat in the blood of its soul. Accordingly, c. LXVII of the 6th deposes any clergyman that eats blood in any manner or by any device whatever, while, on the other hand, it excommunicates a layman for doing so. Canon II of Gangra also forbids the eating of blood and strangled flesh and food offered to idols. There were various reasons why God commanded men not to eat blood. Theodoret says that blood must not be eaten on account of the fact that it is the animal’s soul. Hence when anyone eats meat without blood it is the same as though he had been eating soulless vegetable. But if he eats it with the blood it is evident that he is eating an animal’s soul. Chrysostom says that the reason for not eating the blood is that it was consecrated to be offered only to God. Or it may be that God wanted to keep men from shedding human blood and for this reason commands that they should not eat even the blood of animals, lest as a result they gradually fall into the custom of killing human beings. Adelus says that the reason why God commanded men to eat meat that is free from blood was to teach them by this not to be inhuman and bloodthirsty like the wild beasts, which eat all the animals they kill in the raw state as torn to pieces with the blood still in them, but, on the contrary, to be different from wild beasts, and as rational human beings to sacrifice the animals first by pouring out their blood, and thus to cook their meat in various ways and then eat it. For it is enough for them to become so cruel and compassionless as to slaughter the animals, but certainly they ought not to be so excessively compassionless as to eat them with their blood. Nevertheless, the main reason, and the one nearest the truth of the matter why God commanded men not to eat blood is the following. The blood has the form, or type, of man’s immaterial and uneatable and immortal soul for two reasons: first, because just as the blood of animals, both as something warmer and as something more spirituous, and as something more mobile than other liquids, is their soul but an irrational and material soul, so too is man’s soul, though immaterial and rational, and albeit not blood, as something bodyless and immaterial, yet it uses human blood as a vehicle and instrument or organ of its activities for its own reasons or needs; second, because the blood was shed for the purpose of appeasing the rational souls of human beings, as God says in Leviticus (17:11), “the soul of all flesh is the blood thereof; and I have given it unto you upon my sacrificial altar for you to make an atonement for your souls: for it is the blood thereof that maketh an atonement for the soul.” So whoever eats blood is eating a rational soul, whereof that blood serves as a form or type. But if he does eat it, it is plain that it is something corporeal and material, and consequently renders the soul mortal. “For if you eat this,” says Theodoret in interpreting the above saying, “you are eating a soul. For this occupies the same position as that of a rational soul, because the eating of it is called murder.” So that the Latins, and all other human beings that eat strangled meat, or meat killed by a wild beast, or meat that has died a natural death, and generally speaking meat with the blood in it, or what is the worst of all the blood alone, are sinning against a great dogma. For by so doing they are dogmatizing the rational soul to be both material and affectible like the bodies of man. For whatever occurs in the form, or type, occurs also in that which is typified, or bears reference thereto. That is the same as saying that whatever consequences result from the eating of blood will affect also the rational soul; and for this reason it was that God threatened those who eat blood with death: “Whosoever eateth it shall be cut off” (Lev. 17:14). Possibly, too, in a more mystical sense the eating of blood was prohibited in order to make it plain that just as blood should not be eaten indifferently and similarly to meat, so too the all-immaculate blood of the God-man Jesus ought not to be eaten indifferently and similarly to the other foods, but, on the contrary, with special and surpassing reverence, and with inhesitant faith. As for the fact that the blood of sacrifices had the type, or form, of the blood of Christ, that is one to which the divine Apostle is a witness, since he confirms it in all his Epistle to the Hebrews, and along with the Apostle the choir of divine Fathers do too. But as to that which Origen says in his discourse against Celsus, to the effect that we must not eat blood, in order to avoid being nourished with the food of demons (for there were some men who asserted that demons were nourished by the exhalations of blood); and also as to that which Clement of Alexandria, Origen’s teacher, asserted, to the effect that human beings ought not to eat blood, because their own flesh is irritated and stimulated with the blood—all these ideas, I say, have been placed last in order on the ground that they do not possess so much force and power." "Divine Scripture has commanded us to “abstain from blood, and strangled flesh, and fornication” (Gen. 9:3-4; Lev. ch. 17 and 18:13; Acts 15: 28-29). We therefore suitably penance those who on account of their dainty stomach eat the blood of any animal after they have rendered it eatable by some art. If, therefore, anyone from now on should attempt to eat the blood of any animal, in any way whatsoever, if he be a clergyman, let him be deposed from office; but if he be a layman let him be excommunicated." This is not referring to the juice that may come from a piece of meat when it is cooked, but rather to the blood which is normally drained from an animal at the time it is butchered. And so such foods as "Blood Sausage," and "Black pudding," and some wines that have blood added to them should not be consumed by an Orthodox Christian. Stump the Priest: King David's Census? Question: "Why was God so irate with David for taking a census of Israel? Does it have anything to do with the law in Exodus 30:12 about the census offering?" The passage in 2nd Samuel (2nd Kings in the LXX) 24, actually says that God was angry with the people of Israel: "Again the anger of the Lord was aroused against Israel, and He moved David against them to say, "Go, number Israel and Judah"" (2nd Samuel 24:1). Interestingly, the parallel passage in 1st Chronicles 21:1 says "Now Satan stood up against Israel, and moved David to number Israel." Now, this is not a contradiction. We see from the book of Job, 1st Samuel 16:14, and from the Gospels that even the demons are subject to God, and can only do what God permits them to do. But the Scriptures do not specify why God was angry with the people of Israel, though given that it says that "again the anger of the Lord was aroused against Israel", it is likely that the Israelites were engaged in the same kinds of sins (idolatry, laxity, etc) that we see throughout the historical books of the Old Testament. The commentary from the Fathers that I have available to me does not go into great detail, beyond simply stating that King David was lifted up in pride. Probably he wish to have a census to glory in the strength of the numbers of his people. But the history of the people of Israel should have taught him the lesson that his dear friend Jonathan had learned: "...nothing restrains the Lord from saving by many or by few” (1 Samuel 14:6). "NOW king David was desirous to know how many ten thousands there were of the people, but forgot the commands of Moses, who told them beforehand, that if the multitude were numbered, they should pay half a shekel to God for every head. Accordingly the king commanded Joab, the captain of his host, to go and number the whole multitude; but when he said there was no necessity for such a numeration, he was not persuaded [to countermand it], but he enjoined him to make no delay, but to go about the numbering of the Hebrews immediately" (Antiquities of the Jews 7:13:1). You can read the rest of the story from 2nd Samuel 24 by clicking here; and you can read the parallel account in 1st Chronicles 21 by clicking here. Interestingly, the plague that God sent on the people of Israel as punishment for their sins led to the purchase of the ground upon which the Temple of Solomon was later built. Question: "The last paragraph in the Akathist to the Kursk Root icon says: "...for we have no other help beside thee, no other intercessor, nor gracious comforter but thee, O Mother of God, to preserve and protect us unto the ages of ages. Amen." I have several questions here: 1). No other help beside her? What about our guardian angel and the Akathist to him? Why do we waste our time praying to him if the Theotokos is our only help and intercessor? And why do we waste our time praying to our patron saint and other saints? 2). 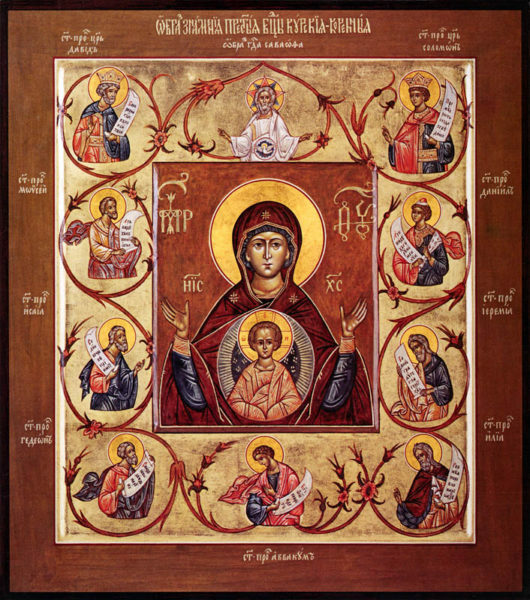 No gracious comforter but the Theotokos? The Holy Spirit has the role of comforter (John 15:26). Does this prayer teach that no other saint or angel can comfort us? 3). We ask her to preserve and protect us unto the ages of ages. This prayer seems to imply that in the heavenly afterlife, Christians are in some sort of spiritual danger, so that we are in need of protection of the Theotokos." You have to first consider the genre of literature you are dealing with. You are not dealing with words from a geometry textbook. You are dealing with hymns, that are poetic. Even outside of poetry, you encounter hyperbole in Scripture. For example, when Christ said "And if thy right eye offend thee, pluck it out, and cast it from thee: for it is profitable for thee that one of thy members should perish, and not that thy whole body should be cast into hell" (Matthew 5:29), the point was not that we should systematically eliminate various parts of our bodies. As St. John Chrysostom observed: "therefore He hath given these injunctions; not discoursing about our limbs; -- far from it, -- for nowhere doth He say that our flesh is to be blamed for things, but everywhere it is the evil mind that is accused. For it is not the eye that sees, but the mind and the thought. Often, for instance, we being wholly turned elsewhere, our eye sees not those who are present. So that the matter does not entirely depend upon its working. Again, had He been speaking of members of the body, He would not have said it of one eye, nor of the right eye only, but of both. For he who is offended by his right eye, most evidently will incur the same evil by his left also. Why then did He mention the right eye, and add the hand? To show thee that not of limbs is He speaking, but of them who are near unto us. Thus, “If,” saith He, “thou so lovest any one, as though he were in stead of a right eye; if thou thinkest him so profitable to thee as to esteem him in the place of a hand, and he hurts thy soul; even these do thou cut off.” And see the emphasis; for He saith not, “Withdraw from him,” but to show the fullness of the separation, “pluck it out,” saith He, “and cast it from thee” (Homily 17:3 on Matthew). So hyperbole, particularly in poetry is a perfectly legitimate way of speaking, but it has to be understood in the manner it is intended. That did not mean that no one else was going to be of any assistance in the fight against Darth Vader. And we are certainly not suggesting that the Theotokos can help us, but God cannot. And again, when it talks about being protected and preserved unto the ages of ages, this does not mean that after we are glorified and in heaven with Christ for all eternity that we will be in the same desperate need of the prayers of the Theotokos, but it does mean that if we ever want to get there, it would be a big help to have the help and protection of her prayers. There are many poetic statements in Scripture that are not likely to be taken literally. For example, we are told in the prophecy of Isaiah that "the mountains and the hills shall break forth before you into singing, and all the trees of the field shall clap their hands" (Isaiah 55:12). Mountains cannot sing, and trees do not have hands. This is poetic statement, that paints a picture, which conveys something true, but has to be understood in the sense in which it was intended.